Behind the 16th window of our Advent Calendar we have Rebecca! 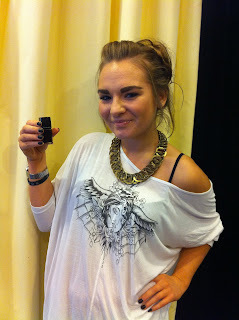 With her favourite Illamasqua product, Nail Varnish in Scorn! Web Customer Service and Logistics Coordinator – providing excellent customer service for Illamasqua.com. I love Illamasqua Nail Varnishes – especially the rubber and matt finish ones. Here I am wearing Scorn (I’m a big fan of black Nail Varnish)! I had a great time at the launch party for our debut Fragrance Freak. I started the evening at our store in Beak Street where our amazing team gave me a transformation before heading to the underground tunnels of London to party the night away.